Hot? 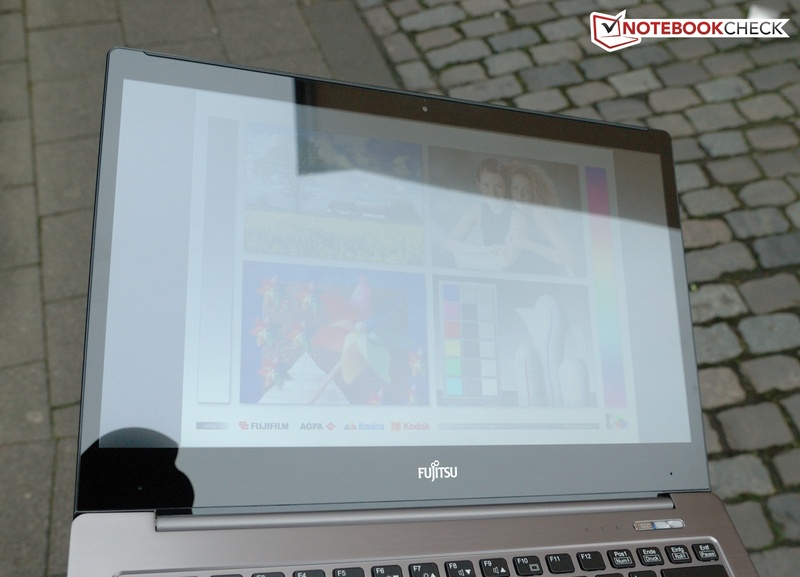 Fujitsu introduces its new flagship, and presents a classy-looking ultrabook alongside a docking station and an ultra-high-resolution touchscreen. The other features are also very promising. 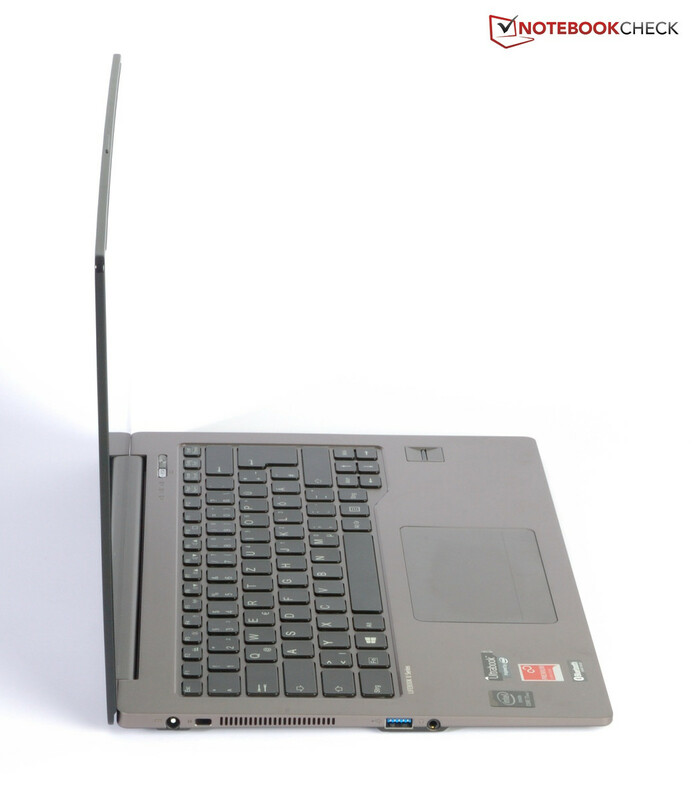 Is the U904 the perfect business laptop for on-the-go professional? 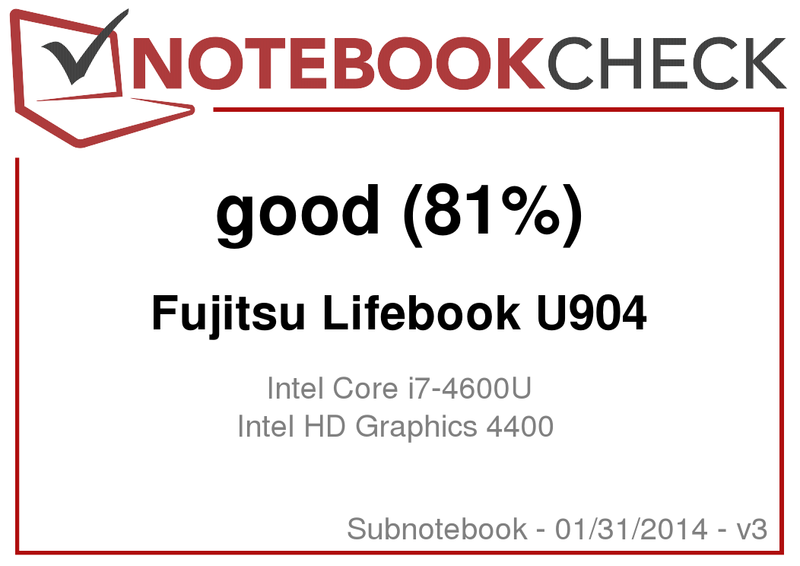 Fujitsu calls its LifeBook U904 the best laptop in the subnotebook category. The price of 1800 Euros (~$2454) for the present configuration is not exactly low, but is still acceptable for a leader. The precise product name of this configuration is VFY:U9040MXPB1DE. We are now curious as to what Fujitsu associates with the "superior" promise. The most striking features are surely the extremely high-resolution touchscreen and docking port that is not found in ultrabooks every day. Consequently, it barely has a real contender. 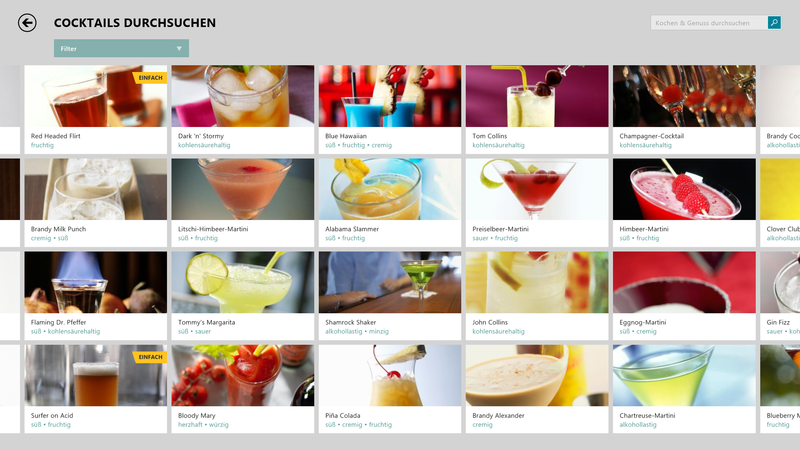 There are a few ultrabooks that feature the high resolution of 3200x1800 pixels, but they are designed for consumers. Thus, we will only deal with these models in terms of their screen. 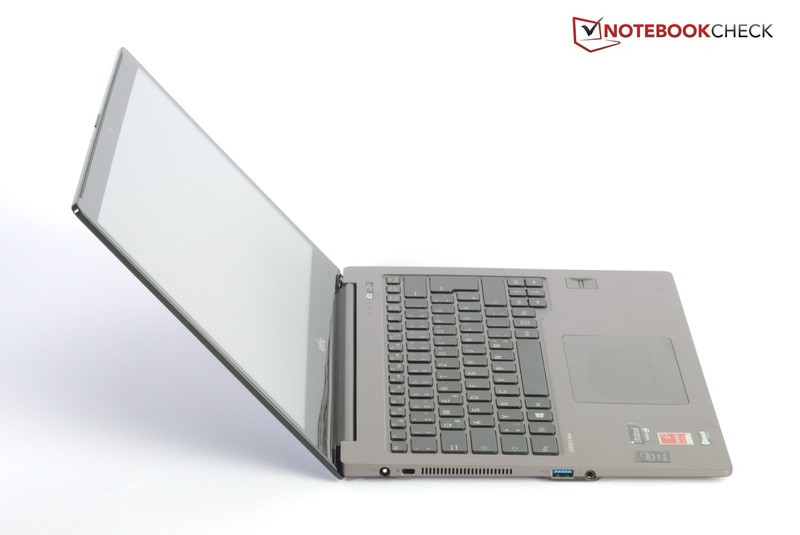 Regarding the business setup, we chose the following three, previously reviewed business laptop for comparison: Lenovo ThinkPad X1 Carbon Touch, Dell Latitude E7440 and HP EliteBook Folio 9470m. However, in view of the high screen resolution, the new ThinkPad X1 Carbon would be on par (review to follow) and the Folio 9470M now has a successor in the Folio 1040 G1 (review to follow). HP only goes up to a Full HD resolution though. Fujitsu was long regarded as a manufacturer that built solid business devices featuring a five-year old design. However, the manufacturer started rethinking a few years ago and we have to say, it has learned quickly. No matter how the laptop is viewed, it always looks classy. The metal display lid is very basic with a matte, black surface. However, when looking closer, a small, glossy area is discovered on the front right corner. 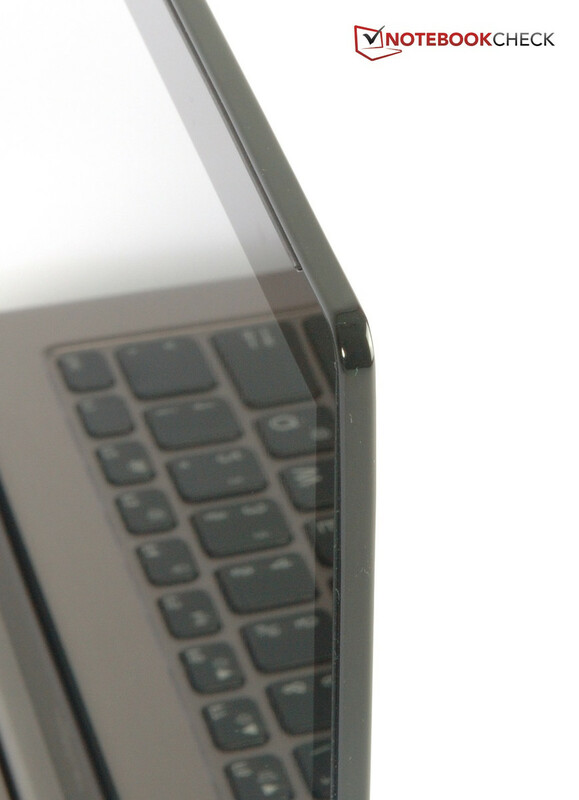 The touchscreen is behind an edge-to-edge glass pane. A rubber rim is embedded over the display's entire upper edge to prevent the glass from lying directly on the aluminum casing in a closed state. The base unit consists of aluminum and magnesium, and can score with its looks. However, Fujitsu could have put a bit more effort in applying the four stickers. When these usually difficult-to-remove stickers are to be placed on the upper side, then they should be placed reasonably in line. The opening angle of 155° should be enough for most application fields. 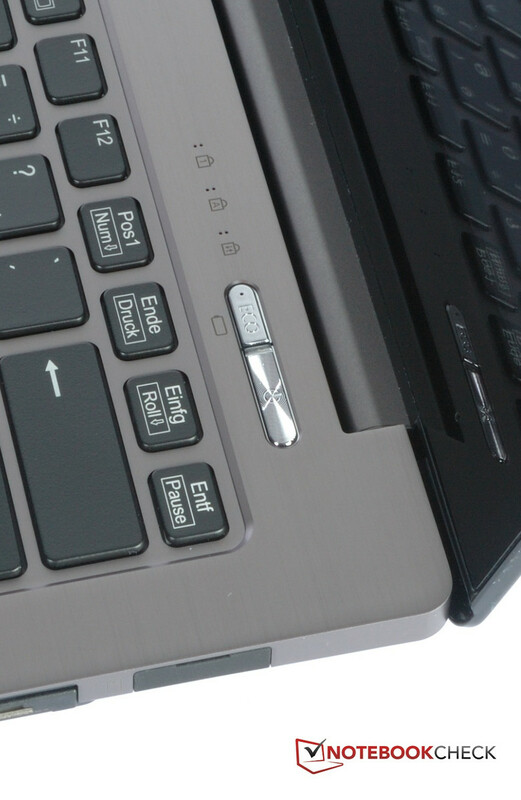 The hinges are quite firm and the laptop can only be opened using both hands. Nevertheless, they cannot prevent the touchscreen from wobbling slightly when inputs are made. Fujitsu still has room for improvement in terms of build and rigidness. There are a few points of criticism, particularly in the display lid's construction, regarding the slightly inaccurate gaps. Apart from that, the lid is not very stiff and is always a bit arched. These flaws are however only noticed when looking very closely. The base unit can be warped slightly and produced unpleasant noises. There is virtually no area on the underside that cannot be dented, in contrast to the upper side that exhibited a mixed presentation. 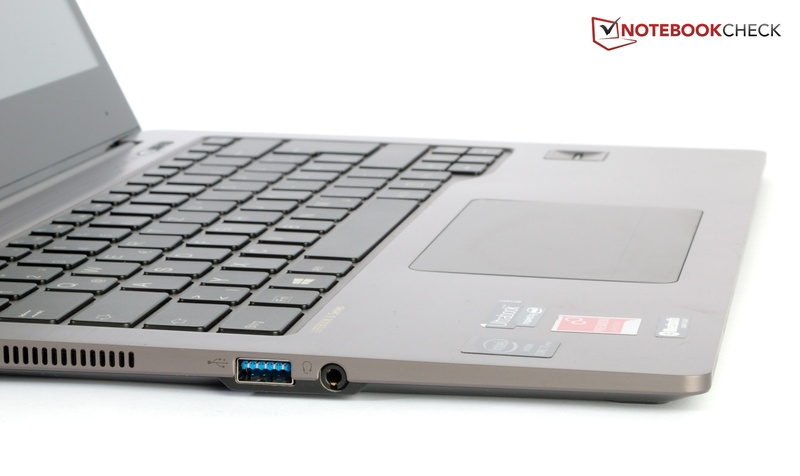 The laptop resists pinpoint pressure on the front quite well; it is very unstable between the keyboard and screen. The dimensions can easily keep up with slim consumers. A maximum height of 19 mm, including the rubber stoppers, is very flat, and the weight of just 1.4 kg (~3.1 pounds) is praiseworthy. The competition has a similar height, but the devices differ in weight. While Lenovo's ThinkPad weighs 1.5 kg (~3.3 pounds), Dell's Latitude and HP's EliteBook both weigh over 1.6 kg (~3.5 pounds). The contenders' build is on par or somewhat better. More often than not, the array of ports suffers under the compact build. This is also true in Fujitsu's U904. On the right is a USB 3.0 port and also on the left beside the audio jack. 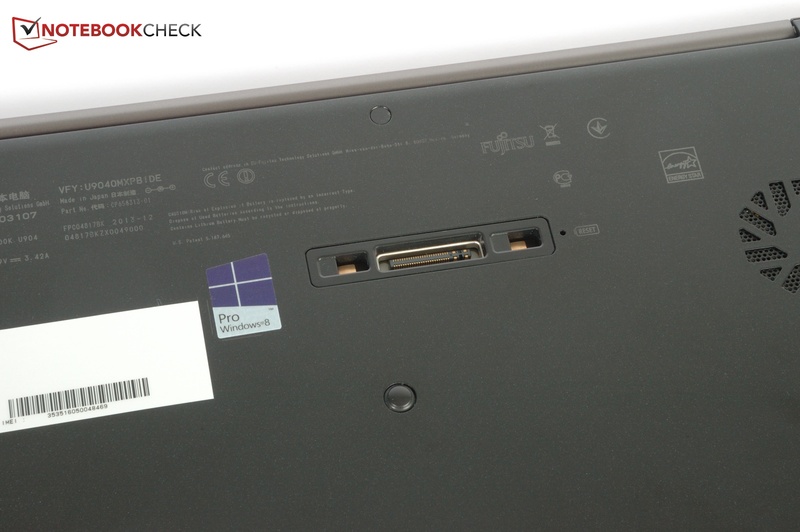 The ThinkPad also has two USB ports only; Dell and HP install three of these ports. Only HDMI is available for video output. Neither the current DisplayPort used in the business sector nor the still often installed VGA port is found. All contenders rely on a (mini) DisplayPort and HP even builds in a VGA socket. 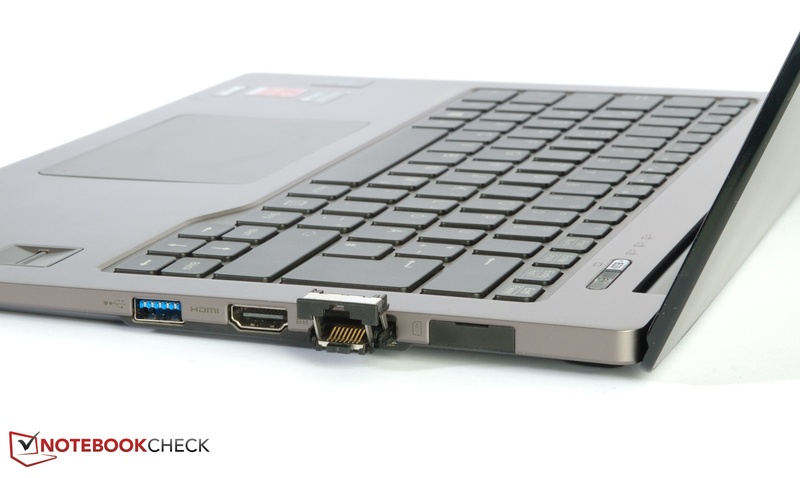 As to the Ethernet jack, Fujitsu makes a compromise and does not completely omit it, like the slim ThinkPad. 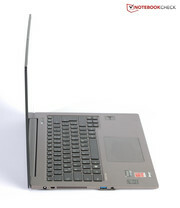 However, it cannot simply be integrated into the thin casing like HP and Dell. It is a bit too svelte for that. Fujitsu's solution is a foldout Ethernet port that is, however, unsuitable for frequent use because of the risk of it breaking off quickly. Nevertheless, users who spontaneously need a LAN connection can fall back on it. Otherwise, using the docking station would be recommended here. The SIM card slot is on the side and easy to access for both the owner and unwelcome guests. 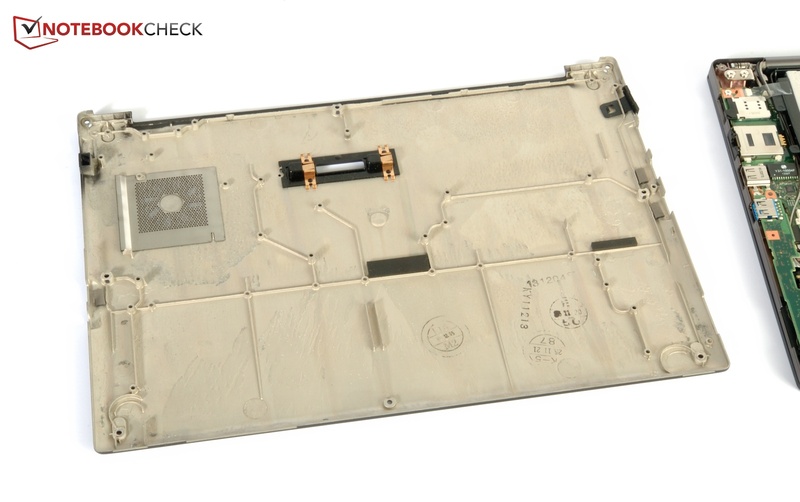 HP hides the SIM card slot underneath an easy-to-remove maintenance cover. This option is not given because Fujitsu discourages the user from removing the cover. Inserting the SIM card is a bit tedious. The flap, which can also be pulled out to an extent, is folded down and then a small tray where the SIM card can be inserted is pulled out. This procedure is not explained in the instructions and is not obvious either. Fujitsu only installs high-quality communication modules. Gigabit LAN is made available via Intel's I218-LM. 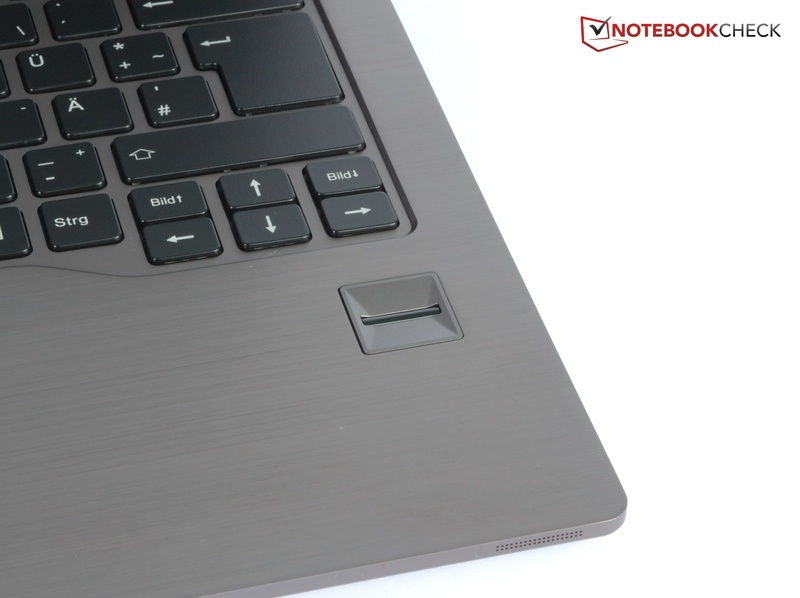 The ultrabook also supports Bluetooth 4.0. The Wi-Fi card also comes from Intel, transmits in both the 2.4 and 5.0 GHz band and achieves long ranges. It supports the a, b, g and n standards, but not ac. However, the Wi-Fi card can be exchanged when required. This action voids Fujitsu's warranty though. In return, Fujitsu installs Sierra's Wireless EM7305 that also exhibits a very good transmission range and even supports LTE. Fujitsu has a few optional services that are to increase data security. Advanced Theft Protection, a fingerprint reader, a TPM module and Full Disk Encryption are among these. 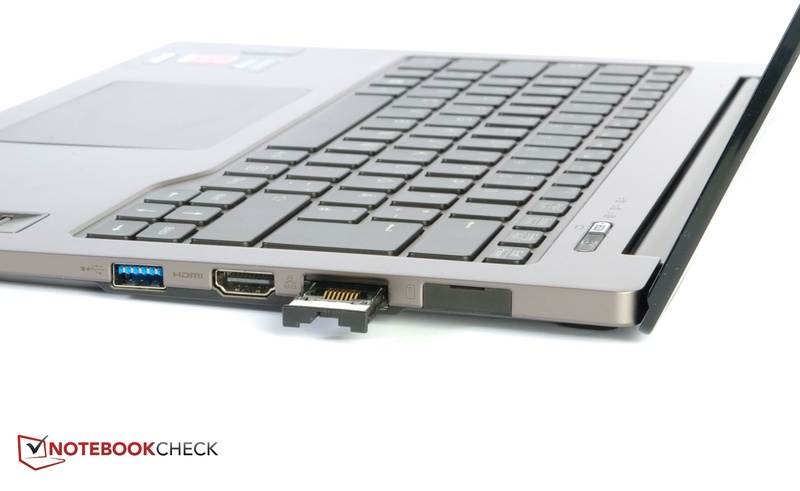 SmartCard readers have to be connected via USB and cannot be inserted in the laptop like in the Dell or HP device. 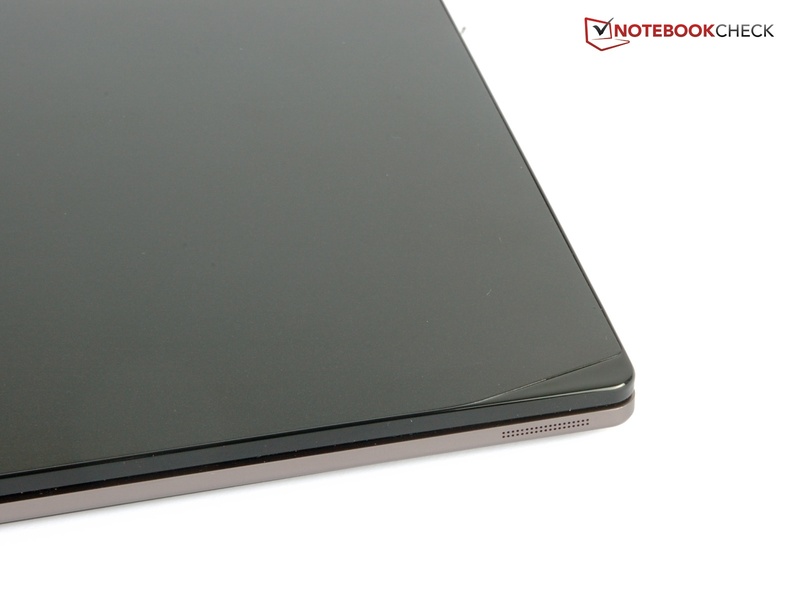 Apart from a small cloth for removing fingerprints on the touchscreen, there are no accessories included for the ultrabook. However, Fujitsu offers a vast range of optional accessories, for example an HDMI-to-VGA adapter or the standard docking station. Fujitsu forbids independent maintenance and threatens with loss of warranty. However, users who want to inspect the laptop's innards anyway can do this with a small Philips screwdriver. Screws are located underneath the front rubber stoppers and the other rubber skirts that secure the base unit's lower tray. When removed, all components can be accessed, including the vents. 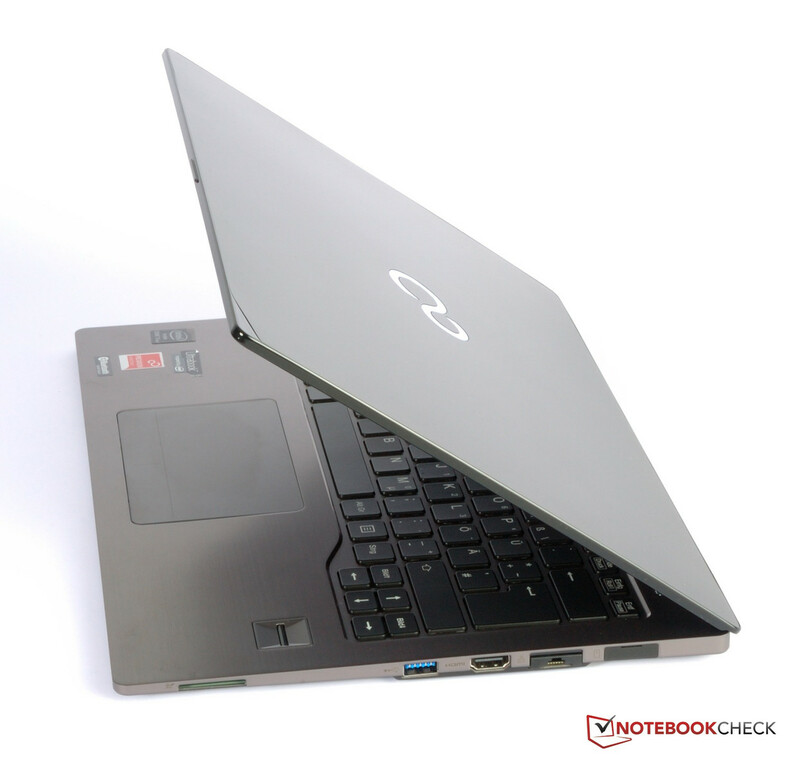 The warranty covers a 24-month period, where the laptop can be sent in. An upgrade to a 48-month carry-in warranty is available in Fujitsu's online shop for 133 Euros (~$181). A four-year service is available for 256 Euros (~$349) and includes the on-site examination by a technician on the next business day. The keyboard's layout is standard and does not have any surprises that require familiarization. The keys have a sufficient size, but are absolutely even. A backlight can be turned on when the ambient light gets too dark to see the lettering. The typing feel is unsatisfactory in the author's opinion. The drop is relatively short and lacks a clear pressure point. A rather firm stroke is first achieved when typing with enough force and a sufficient feedback is given. Users with a softer typing style will never be sure whether the keyboard detected the input. The keyboard bed particularly yields in the back area. The touchpad's area of 110 x 72 mm (~4.3 x 2.8 inches) is very generous. The finger also glides easily over the surface and all inputs are detected accurately. The touchpad is not sufficiently separated from the wrist rest everywhere. It is a bit deeper than the surrounding wrist rest surface at the front left. In return, the pad juts out a bit on the right. Being a ClickPad, there are no dedicated mouse keys. A right click can be performed anywhere on the touchpad, except for the front right where an area is visibly separated. This works very well in the front two thirds of the area, but the ClickPad is very stiff in the rear area and can only be used with some effort there. The touchscreen detects 10 fingers at the same time without problems. The inputs are usually implemented accurately, despite the sometimes very small icons. The smallest fields are hit surprisingly well with a bit of practice. The most interesting thing about this screen - if not about the entire laptop - is the resolution of 3200x1800 pixels. That is a complete novelty in the business ultrabook sector and rare elsewhere as well. However, let us start from the beginning: The screen comes from Sharp and carries the model name LQ140Z1JW01. The IGZO technology is a specialty from Sharp and allows colossal pixel densities, like the 260 ppi in our review sample, that were until now known only in smartphones. Single pixels are virtually invisible even when looking at the screen from a very close distance. This leads to a sharpness that can barely be surpassed, for example, in 4K videos. The apps from the store all also scale wonderfully on this resolution. A big problem is discovered when the user wants to use standard desktop programs. Not everything can be read in a 100% display size and high pixel density even with good eyesight. Although Windows allows scaling to 200%, it does not work with all programs. The only reasonable solution for productive use is setting the screen from 100% to a resolution of 1600x900 pixels, where the resolution is halved both horizontally and vertically. 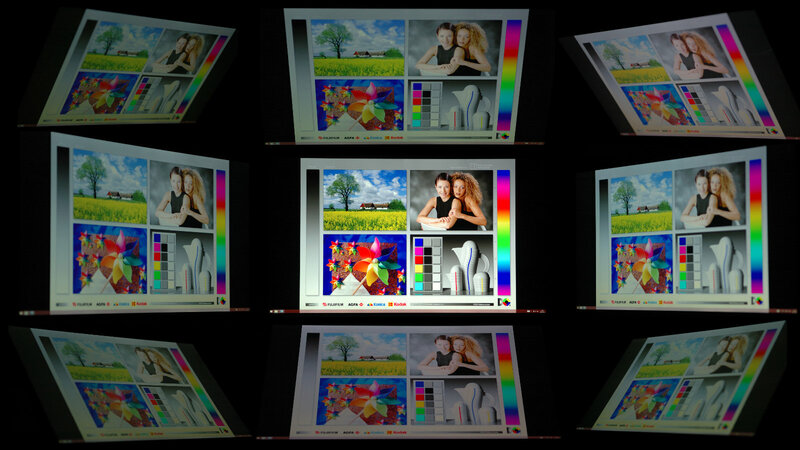 However, the image then looks a bit faded and lags behind screens with a native resolution of 1600x900 pixels. 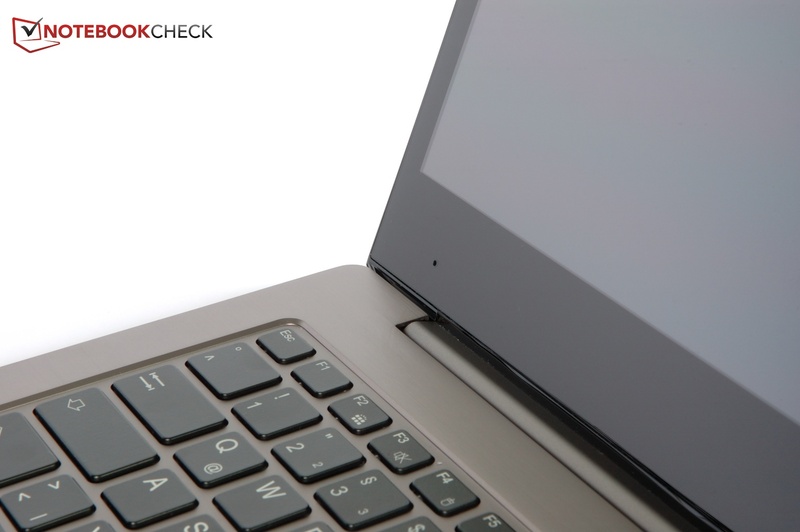 Our interim conclusion about the screen is therefore: Users who can really use this high resolution and pixel density will now finally find a business ultrabook that offers it. However, users who not only use the apps and maybe have to fall back on older programs should carefully consider before buying such a screen at this point in time. The contenders from the business sector rely on only 1600x900 pixels (Lenovo and HP) or 1920x1080 pixels (Dell), which already have a high enough resolution even without scaling effects. We have to look around in the consumer sector in order to better evaluate the screen. Here, we find Samsung's ATIV Book 9 Plus 940X3G ultrabook that has the same resolution, but a slightly smaller screen diagonal (13.3 inches). The average brightness is 305.6 cd/m², whereby the illumination of 90% is relatively good. The brightness is maintained in battery mode. 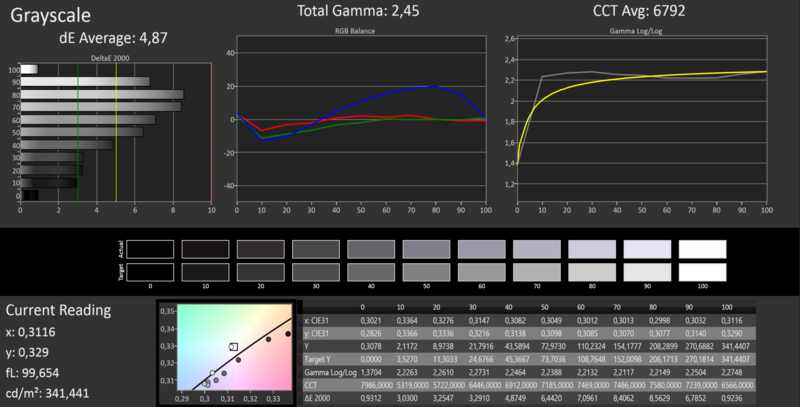 Samsung's ultrabook has a marginally lower brightness of 264.3 cd/m². The difference is even bigger in black level and contrast. The U904 can unquestionably score here. With only 0.25 cd/m² of residual light, and consequently a very high contrast of over 1250:1, it not only surpasses the consumer ultrabook (772:1) but also all contenders from the business sector. 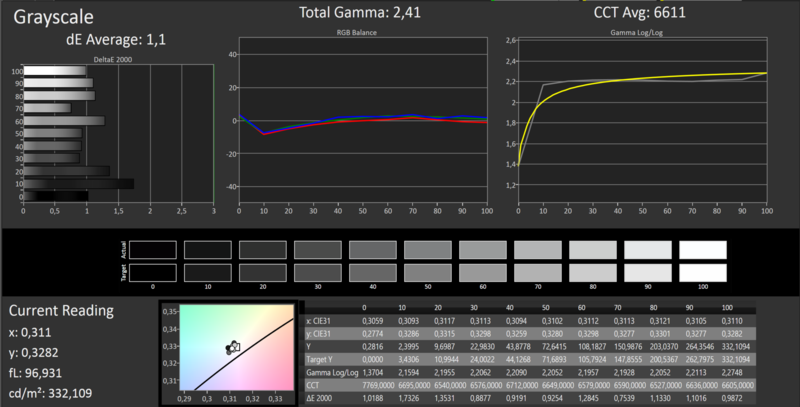 The screen's color space is similar to the sRGB color space, but it does not come even close to AdobeRGB. The grayscale deviates more from the ideal value as the color white increases in intensity. However, grayscale reproduction is exemplary after calibration. The screen's saturation also benefits from calibrating. Minor shifts were noticed in blue and cyan before that, but could be eliminated for the most part. 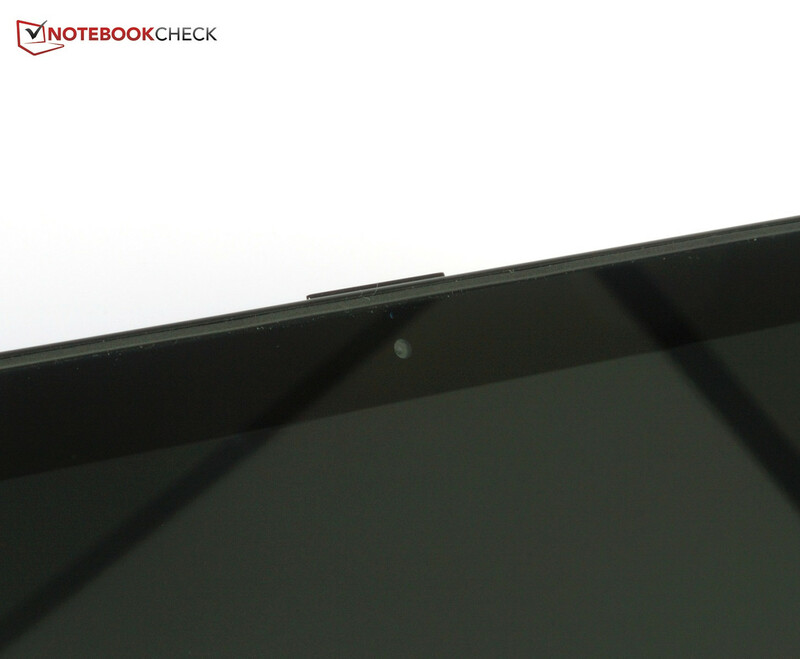 As common for touchscreens, the ultrabook's display is not AR-coated. Consequently, working in bright surroundings can get unpleasant when the ambient light is reflected too intensely despite the high brightness. The ThinkPad X1 Carbon Touch that also features a touchscreen has an AR-coated screen, and can thus score in bright surroundings. The screens from HP and Dell are at least optionally available as non-glare models. The viewing angles cannot quite compete with contenders featuring an IPS screen. 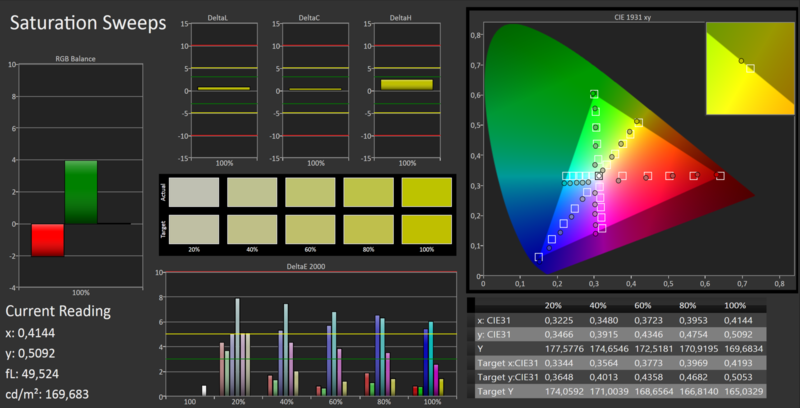 Color deviations when looking at the screen from below are particularly striking. Besides that, the screen darkens clearly to the side. 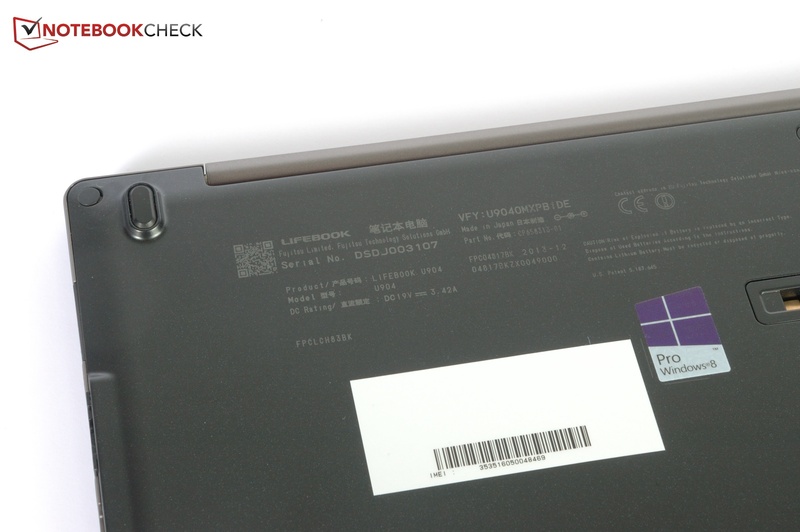 Nevertheless, the viewing angles are slightly better than those of TN screens are, such as used in the ThinkPad. Our review sample sports Intel's Core i7-4600U alongside the integrated Intel HD Graphics 4400 chip. A 256 GB SSD and 10 GB of working memory supports it. 2 GB of RAM is soldered directly on the motherboard and an 8 GB module is inserted. The U904 is also available in another configuration, featuring Intel's Core i5-4200U, 4 GB of RAM and a cache SSD solution, for approximately 400 Euros (~543) less. The installed Intel Core i7-4600U processor belongs to the ultra-low-voltage processors with a TDP of 15 Watts. Its two cores operate at 2.1 GHz by default, but can be overclocked to 3.0 GHz when necessary. It can even achieve 3.3 GHz when only one core is loaded. 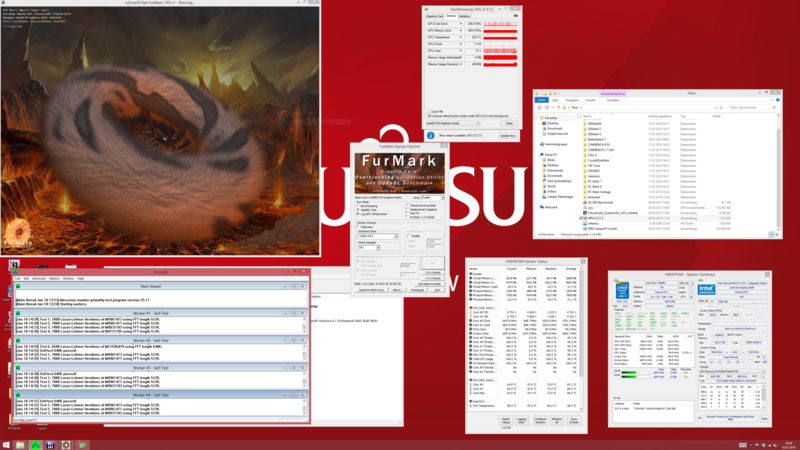 Although the processor in the ThinkPad X1 Carbon Touch has a lower clock frequency, and is also a ULV processor that comes from the last generation, the Intel Core i7-3667U's Cinebench R11.5 score of 2.96 points is much higher than Fujitsu's U904. The clock was 3.0 GHz in the first few seconds in Cinebench R11.5; after that, it was always a bit over the base clock of 2.1 GHz. The U904 does not quite match most competing laptops, despite its better specs because it does not max out its Turbo Boost. The laptop's performance is not lower in battery mode than in AC mode. The subjective Performance efficiency in routine office use is very fast. There are barely any waiting times owing to the SSD and Windows 8.1. 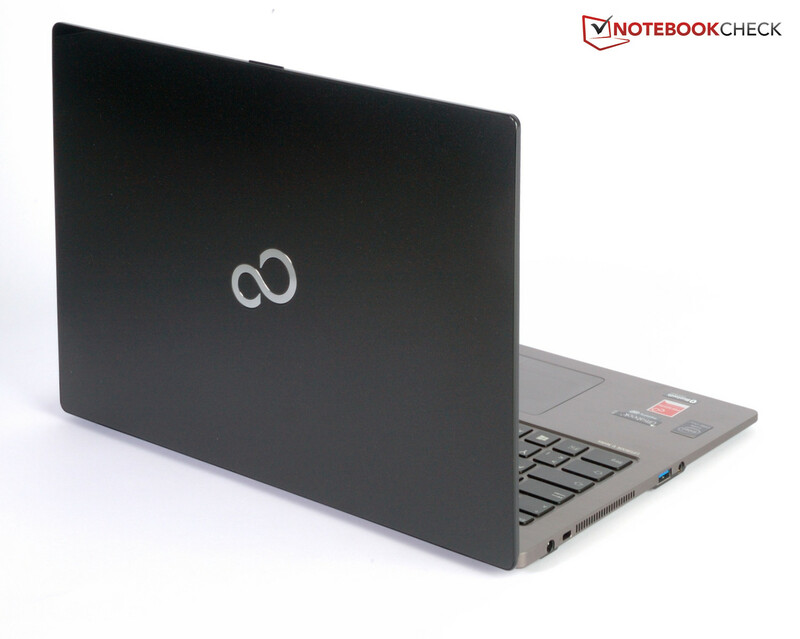 The ultrabook boots within 15 seconds and is ready for use. 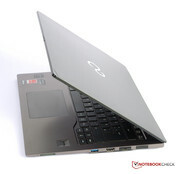 The laptop also scored well in PCMark 7. In particular, Dell's Latitude clearly falls behind because it only sports a conventional hard drive. 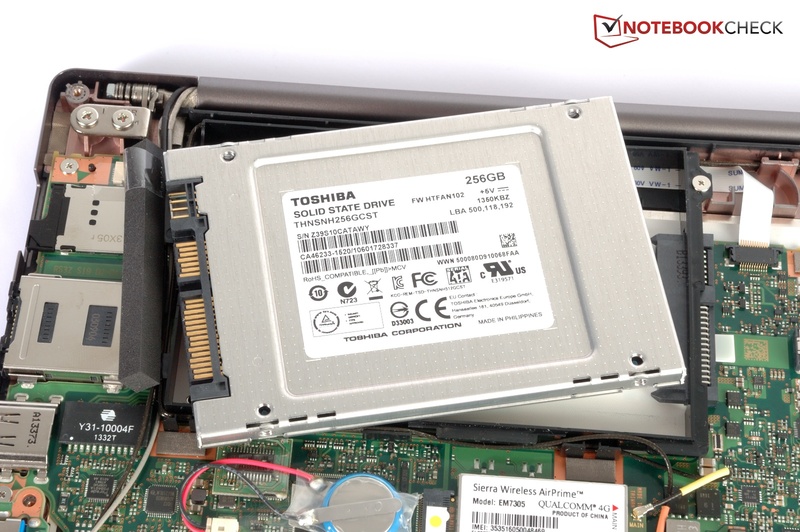 As to the storage device, Fujitsu relies on an SSD that comes from the Japanese manufacturer Toshiba. It has a capacity of 256 GB and features the classic size of 2.5 inches. The access time of 0.1 ms in read is extremely low and incredibly speeds up routine work. The SSD achieves good results in the sequential and the 4k benchmarks and belongs to the speedier storage devices of its kind. Intel's HD Graphics 4400 takes care of graphics output. This graphics solution is integrated into the processor, making an extra graphics chip superfluous. The contenders do not sport a dedicated graphics card either and they all rely on integrated solutions from Intel. The performance of these solutions is easily enough for many application fields. It is also very difficult to install high-performance graphics cards in slim casings. However, the graphics solution soon finds its limits in high-requirement computer games or CAD programs. CPU and GPU throttling makes the ultrabook unsuitable for computer games. Even the rather undemanding F1 cannot be rendered smoothly. Devices featuring comparable hardware, but without throttling issues, have the lead here. The ultrabook is barely audible when idling. 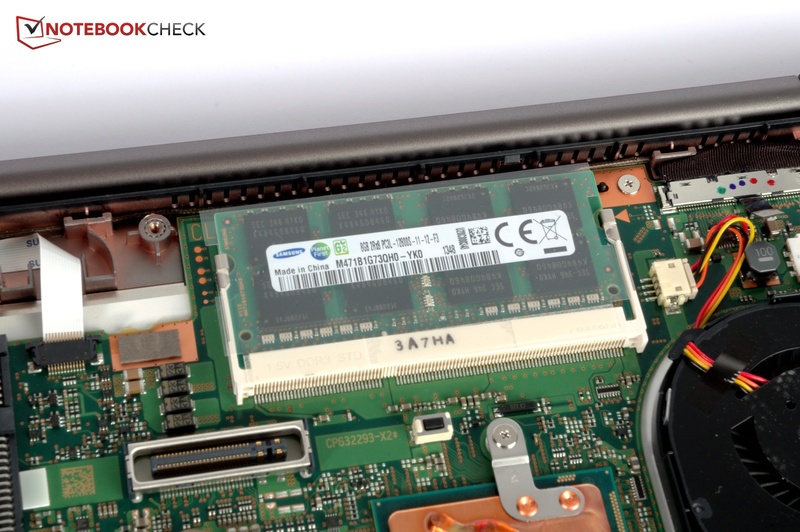 The SSD does not produce noise owing to its architecture and the fan is very restrained during low load. Consequently, the noise level usually remained below 30 dB(A) and is thus barely perceptible. The contenders are similarly quiet, although the LifeBook is the best in this department. 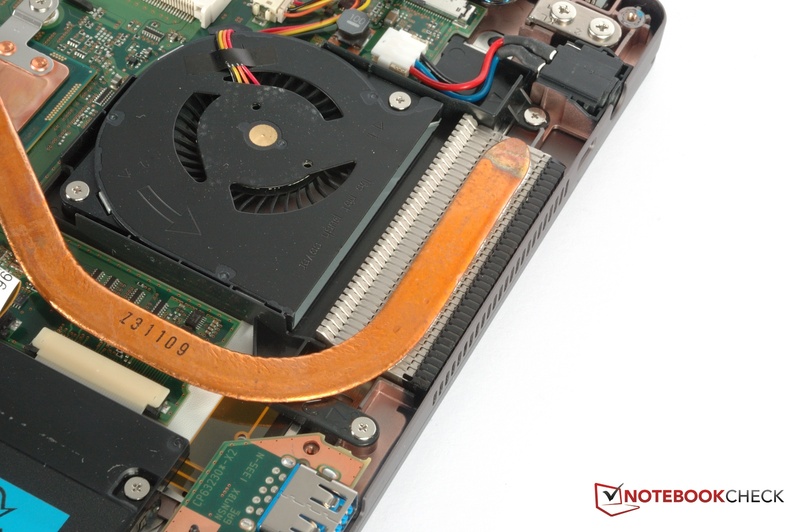 The fan speeds up during load and suggests an overall very quiet laptop when only looking at the noise assessment. Unfortunately, the laptop starts to squeal even during simple load (fan speeds up temporarily) and this is unpleasant. The laptop remained very cool in both idle and low load. It never surpassed a temperature of 30 °C (86 °F). Therefore, it would always be possible to use the laptop on the thighs. 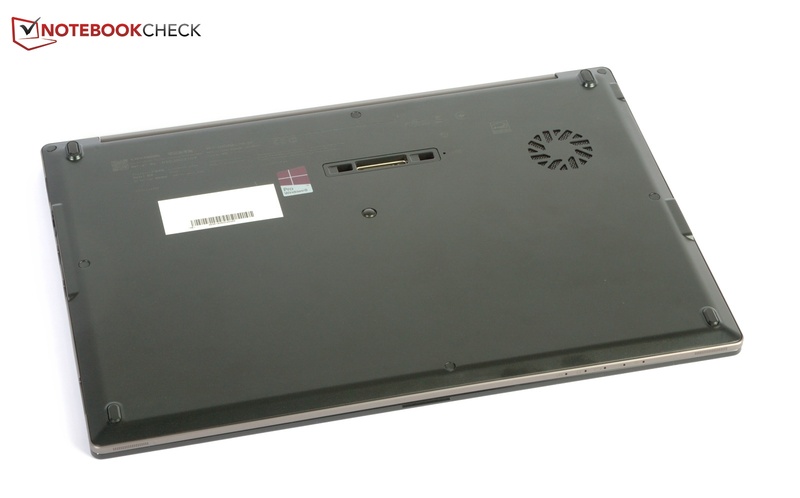 The thicker Dell Latitude stays similarly cool; both the ThinkPad and EliteBook reach over 33 °C (91.4 °F) in some areas. The ultrabook reached up to 42 °C (107.6 °F) during load. Thus, it is still considerably cooler than the ThinkPad that heats up to 55 °C (131 °F) on both the underside and upper side. The CPU and GPU are put under full load for over an hour in the stress test. We observe the course of the chip's temperature and clock rates. The CPU's clock fluctuated between 1.1 and 2.2 GHz at the beginning and the GPU ranged from 750 to 1100 MHz. This proves that Turbo Boost is not exploited from the outset. The CPU's clock rate settled to around 2.0 and 2.1 GHz after three quarters of an hour. However, the GPU's clock rate varied between 200 and 1050 MHz almost every second. The graphics output stuttered very clearly when the clock dropped to 200 MHz. Just before we stopped the test, so after about an hour, the CPU's clock was 1.7 GHz and the graphics card still fluctuated widely. The HD Graphics' clock also fluctuated between 200 and 1100 MHz in a cold start, whereby the 200 MHz-periods were directly perceived as stuttering. The CPU's clock always remained above the default clock of 2.1 GHz. HWiNFO recorded a fairly stable chip temperature of 68 °C (154.4 °F) during the test. This leads to the overall impression of a configuration that is not well matched with the cooling solution. Speakers are not particularly significant in the business sector. They are not very suitable for music enjoyment either. However, the speakers are sufficient for a short presentation. Nevertheless, this is only a less than satisfactory offering in view of the price. The power consumption ranges between 5 and 10 Watts in idle and during low load. This low energy requirement is achieved by the CPU's sophisticated power saving measures, as well as the SSD. While Dell's Latitude consumes approximately 2 Watts less with its marginally weaker processor, the ThinkPad needs 6 to 13 Watts. 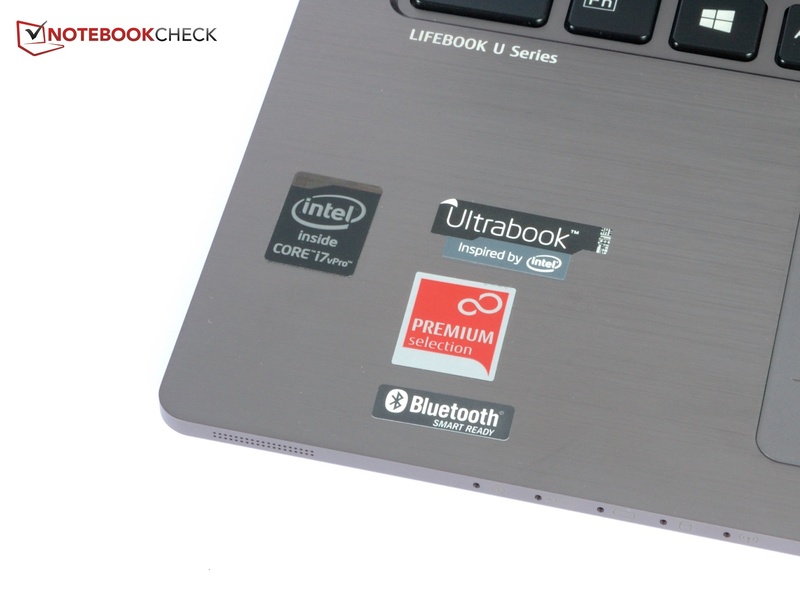 The LifeBook is the most frugal laptop during high load. With a maximum of 25 Watts, it consumes even less than the Dell's 33 Watts and both HP and Lenovo clearly surpass that with roughly 37 Watts. Unfortunately, these rates are paid for with the intense throttling of the graphics solution and CPU. The slim, 65-watt power supply's size is clearly sufficient. 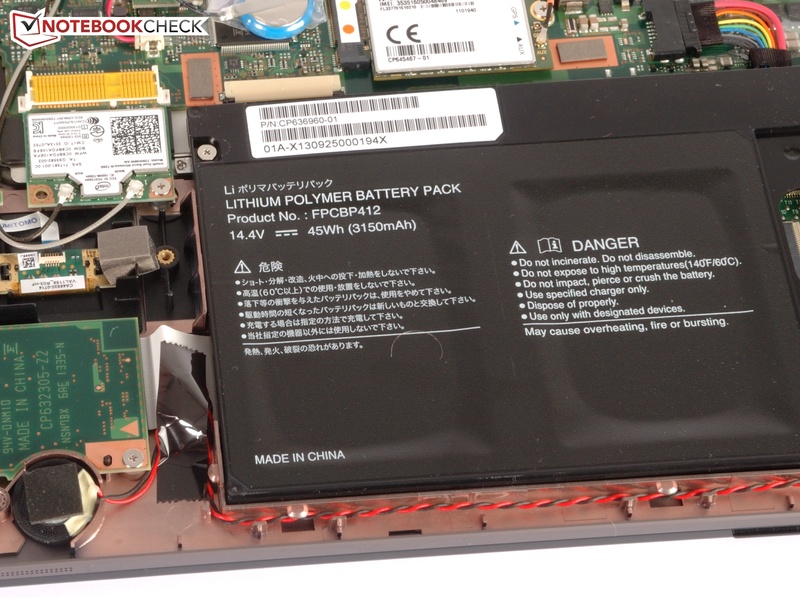 A 45 Wh lithium-polymer battery is built into the LifeBook U904. It cannot be removed or replaced. The laptop lasts for over 12 hours away from the outlet in idle, ascertained using Battery Eaters Reader's test that simulates reading a text document. Thus, it easily surpasses the contenders. However, the browsing via Wi-Fi test is considerably closer to real-life use. Internet browsing is performed via Wi-Fi using the screen's medium brightness setting. The laptop lasted for 6 hours and 24 minutes and is thus in the midfield of our comparison devices. 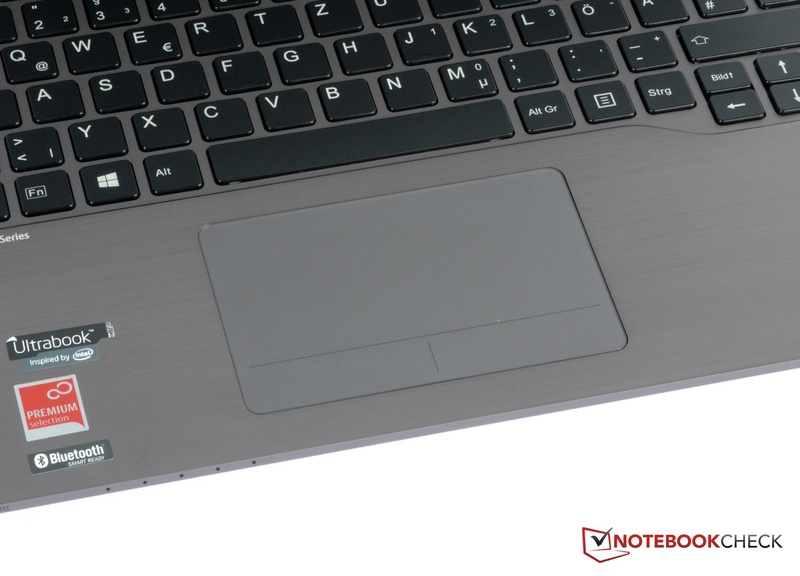 HP's EliteBook has the highest capacity battery with 52 Wh and lasts for 7 hours and 39 minutes. The 34 Wh battery in Dell's Latitude is drained after only 5 hours and 17 minutes. 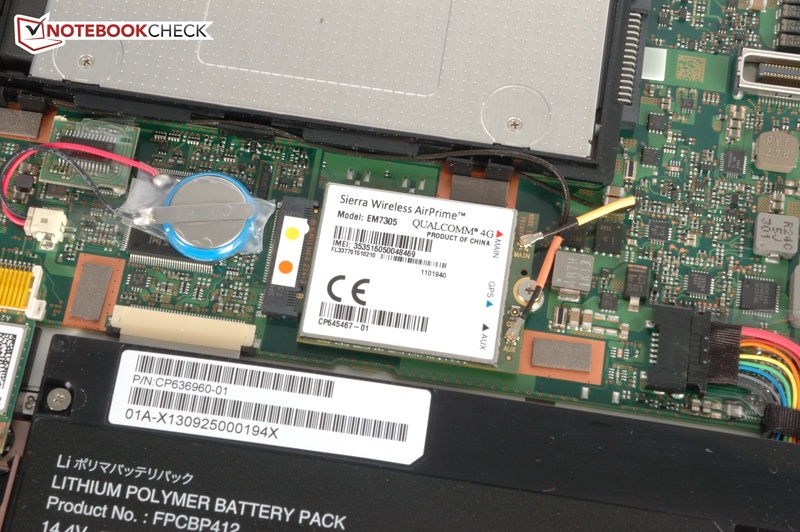 The ThinkPad's battery also features a capacity of 45 Wh, but lasts for half an hour longer. An animated 3D scene is rendered during load using the Battery Eater Classic tool, which loads both the CPU and GPU. The laptop lasted for 2 hours and 24 minutes without the power supply. The ThinkPad does not last quite as long because it uses the Turbo Boost to a greater degree. Fujitsu states a battery recharge time of 2 hours. In fact, the manufacturer is pretty close to that. We needed 115 minutes for recharging. 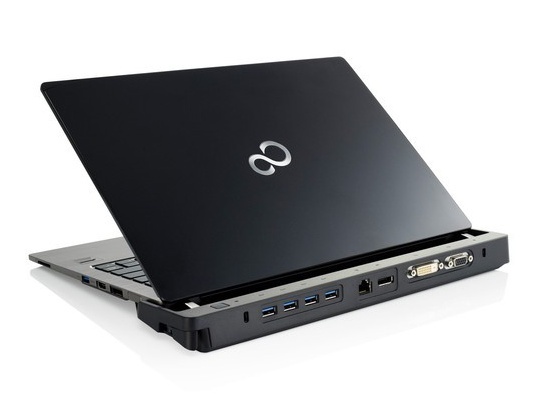 Our review configuration of the LifeBook U904 is currently sold for approximately 1800 Euros (~$2454). 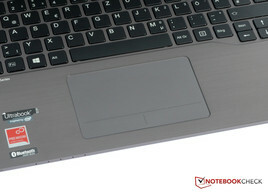 The ultrabook aims to be a full-blown business laptop, while paying attention to looks and weight. The first impression is very good. The materials are high quality and the design looks balanced. Unfortunately, there are still flaws in the build in some places. Apart from a few exceptions like video interfaces, the connectivity is sufficient. There is even a docking station port on the underside. Both the Wi-Fi and UMTS card are high-end; only the Gigabit LAN socket does not make a trustworthy impression. The keyboard is one of the biggest disappointments. The lack of feedback and hard stroke will be too trying for most prolific writers. The ClickPad is also a bit stiff in some places, but it functions accurately otherwise. The touchscreen is beyond reproach and works meticulously. The ultrabook's highlight - the high-resolution screen - is a nice gimmick that, however, cannot be used sensibly at this time. At least the brightness and contrast are agreeably high. However, the intense reflections in outdoor use will annoy the user. The performance is relatively weak despite Intel's Core i7, which is due to the GPU's heavy throttling. This is barely noticed in routine use - and quite the contrary: The performance in office use seems very fast owing to the SSD. Programs with high graphic requirement suffer under this problem though. The temperature is acceptable during normal load, but the otherwise quiet laptop starts to squeal unpleasantly then. The battery runtime is sufficient, but not exceptional. 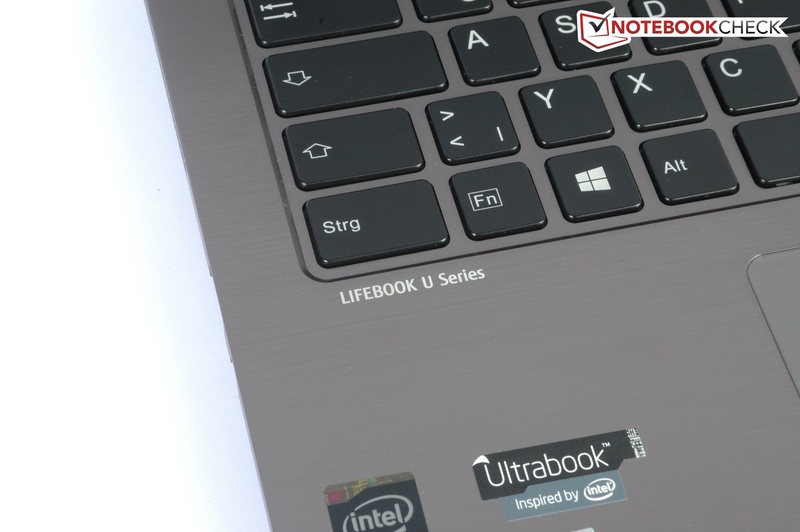 Buyers who can ignore the major points of criticism, like the reflective screen and inferior keyboard, and do not expect high performance from a laptop, can take a closer look at the LifeBook U904. That is, providing the screen's high resolution can be used reasonably. Fujitsu introduces a new ultrabook. 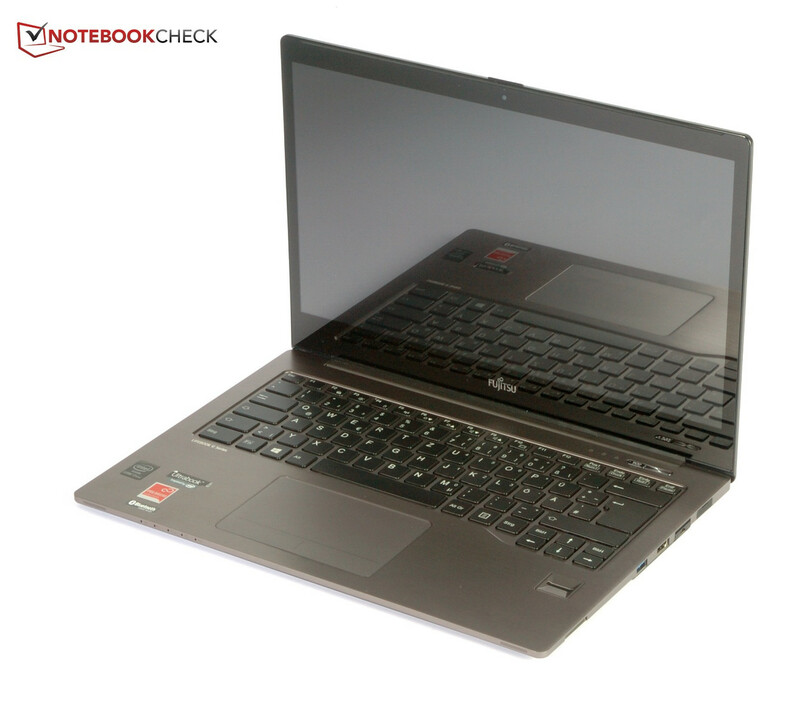 The LifeBook U904 is Fujitsu's business flagship. Fujitsu has compiled an interesting bundle here. The highlight is the 3200 x 1800 pixel screen. ...but not the gaps. Too bad. The stickers could have also been more in line. Two tightly pulled hinges hold the screen. Thus, opening is only possible using both hands. ...and makes a very classy impression. The ultrabook is ready to go only a moment after turning on the ultrabook. It only needs 15 seconds to boot. Instead of remembering passwords, a fingerprint can be used to login. The webcam only features an HD resolution. The mic records in stereo, and is located on the screen's right and left. The power socket and Kensington are on the rear left. One of the two USB ports is located further in front. Ethernet would normally not have fit in the casing. Now a pull-out model is installed. But it is not stable. Only SD cards can be read here. The writing on the underside reveals more about the exact configuration. The docking station port is also found here. All screws on the underside are hidden behind rubber skirts. The bottom tray can be taken off after removing them. The tray is also made of a magnesium alloy. It is possible then to access all important components. The non-removable battery is seen in the screenshot. The battery is plugged in and only glued to the motherboard. It is also possible to access the fan for cleaning purposes. The LifeBook allows Internet browsing via the mobile network. The sole RAM bank is furnished with an 8 GB module. The hinge cannot prevent a slight wobbling. Here, the small and weak speakers. The SSD features a conventional 2.5-inch size. The slim design fused with the docking station port. Input devices appropriate for the application field and price range. We would not have expected such a faulty cooling management in a flagship product like the U904 wants to be.